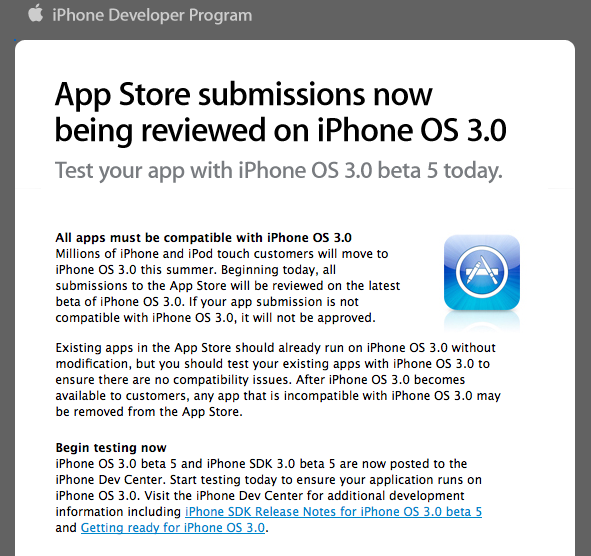 Apple has just sent out an email alert to iPhone developers that any new app submitted to the App Store will have to be ready for the iPhone 3.0 software, which is due shortly (probably around Apple’s WWDC event in June). Beginning today, any app submitted that isn’t 3.0 compatible will be rejected. I’ve emailed Apple asking if there are any features specifically that developers should be careful about making sure work in the new 3.0 firmware. Google recently outlined some of the key points of the new Android firmware that developers should watch for in order to maintain compatibility. Apple also says that most apps will run on 3.0 without any changes, however, some major changes were made and I suspect any app using a UIAlertView (pretty much any app with a confirm/deny dialog) will need to be changed due to the change made to the indexing order of the buttons on that view.